Bára Látalová is looking at the world around her – exploring it and being surpirsed - with the eyes of a child. She is playing with the physics, body and soul, she leaves us watching her play and her perception of things. She is searching a language both for an adult and a child – a child who understands more everything concerning the nature. The decision to invite B8ra Látalová to Bratislava is based exactly on the fact that she wants to offer her way of perceiving things also to a little spectator. I devote my time – already for a longer period – to the developmental aspects of movement and perception of kids, also to the direct work with children, I think my support and impulses could bring the choreographer some new possibilities of her way of exploring this way. The work of Bára Látalová has found my interest especially in the connection with the subject invented to attract also a public of children. I think, that addressing this age of spectators is these days one of the priorities in the frame of the development of the contemporary dance. The second reason to select Bára Látalová was for me the fact of a supposed correspondence between the choreographer and the mentor which is definitely one of the most wanted thing concerning the progress of the work. Barbora Látalová graduated from the Duncan Centre Dance Conservatory in Prague in 1997. Barbora Látalová is a dancer and choreographer who is continually posing new questions for herself, and who does not hesitate to travel in search of new opportunities in order to expand her education. She is performing in several projects concurrently, including those of the international company Nie of Alex Byrne, pieces by Czech choreographers and, more recently, childrens' performances. She worked as a pedagogue for three years at the professional acting school, HINT (Hige Skole i Nord Trondelag), in Levanger, Norway. 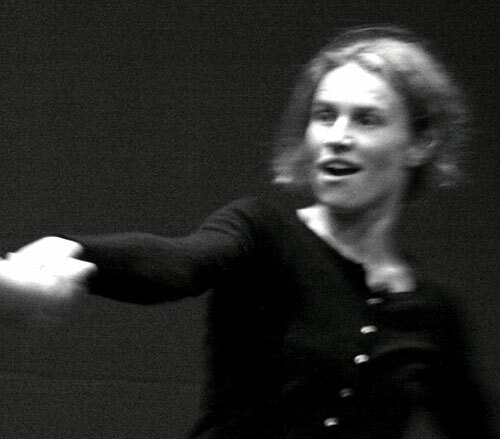 As a choreographer, she has cooperated with Veronika Švábová eg. on the performance Od začátku do konce and created, along others, the pieces Údolí, Margareta Tells a Story and Fg=Gm1m2/r2. As a result of her strong interest in work with children and her professional approach, she was selected as mentor to Anka Sedláčková for an artistic residency in Bratislava.